The surname of BUNK was derived from the Old French ‘bon-coer’ meaning a man of good heart, a happy cheerful person. Early records of the name mention William le Bonquer, 1273 County Oxford. John le Boncer, 1273 ibid. Jeremiah Smith married Elizabeth Buncker in Canterbury, Kent in 1662. William Bunker married Jemina Skedmore at St. George’s, Hanover Square, London in 1796. The earliest French hereditary surnames are found in the 12th century, at more or less the same time as they arose in England, but they are by no means common before the 13th century, and it was not until the 15th century that they stabilized to any great extent; before then a surname might be handed down for two or three generations, but then abandoned in favour of another. In the south, many French surnames have come in from Italy over the centuries, and in Northern France, Germanic influence can often be detected. The acquisition of surnames in Europe and England, during the last eight hundred years has been affected by many factors, including social class and social structure, naming practices in cultures and traditions. On the whole the richer and more powerful classes tended to acquire surnames earlier than the working class or the poor, while surnames were quicker to catch on in urban areas than in more sparsely populated rural areas. The bulk of surnames in England were formed in the 13th and 14th centuries. The process started earlier and continued in place names into the 19th century, but the norm is that in the 11th century people did not have surnames, whereas by the 15th century they did. It has long been a matter of doubt when the bearing of coats of arms first became hereditary and it was not until the Crusades that Heraldry came into general use. Men went into battle heavily armed and were difficult to recognise. It became the custom for them to adorn their helmets with distinctive crests, and to paint their shields with animals and the like. 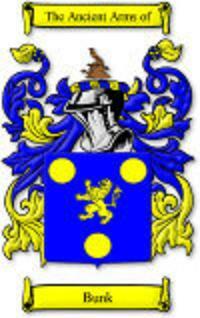 Coats of arms accompanied the development of surnames, becoming hereditary in the same way. -Information send by Gladys Zerquera June 6 at 3:41pm, facebook.com-.